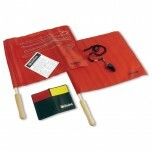 Choose from red volleyball referee linesman flags separately or save as kit with other accessories. This kit has all the essentials needed for a beginning official. The only reason I didn't give it a 5th star is the quality of the whistle and flags. But for the price it will get a novice volleyball official what they need to get started. I'm new to officiating volleyball. This set contains flags of exceptional quality. Overall, I'm satisfied with this purchase. 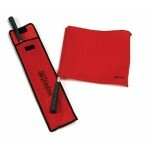 Excellent, I can carry my whistle and penalty cards in the back compartment of the flag bag.